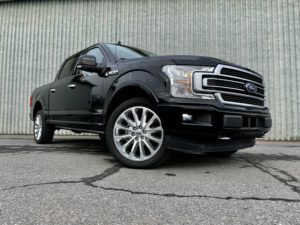 These F-150 SuperCrew models offer tremendous rear seat room which contributes to the Limited’s dual-purpose role of work truck and family mover. And that’s what this kind of rig is all about; a one vehicle solution that blends America’s best-selling truck with attributes of an executive sedan and the versatility of a sport ute. And most of it is done is very well; handsome styling, confident power and features galore. But the F-150 is facing some very stiff not to mention much newer competition and in some ways that shows. Yeah. This Limited’s cabin is pretty awesome but it can’t match the freshness and polish that Ram is offering these days. Still in all, with massaging seats, a plush ride and a quiet cabin I’d drive this truck anywhere. But its real killer-app is under the hood. This truck is a total sleeper that’ll blow the doors off of most everything it encounters. It takes a second for the turbos to reach boost, but then it’s off to the races with impressive acceleration. But the Limited is docile until provoked; well-mannered and much easier to maneuver than it looks, thanks in part to the 360 degree camera that can be accessed at the press of a button. The drive mode switch seem like an afterthought tucked away down here but the gauge display, including a plethora of off-road information and much more, is straight from the Raptor’s playbook. It looks great and it’s easy to navigate. I’m less excited about Ford’s SYNC infotainment system…particularly in this tester which acts slow and glitchy and looks far too basic for a vehicle of this ilk. I find it somewhat aggravating to use. And though the massaging front seats are a nice touch the motors and air bladders controlling then are ridiculously loud…Bentley loud. This truck is very cool because no one expects it to be so darn fast. Unless you keep up with your Ford news this Limited may just look like another luxo-rig. But it’s much more than that. With various drive modes including sport that adds Raptor-like sounds to the visceral experience, the F-150 Limited spans a wide chasm of purposes and driving styles. Just because it looks pretty doesn’t mean it can’t do the dirty stuff. With a 4-wheel drive system that includes the beneficial “auto” setting, a locking rear differential and a 10-speed automatic that can be manipulated to do specifically what you’re asking of it, the Limited, with its convenient bed step, spray-in liner and dummy proof Pro Trailer Backup Assist is ready for work. Though running on Pirelli Sport Truck tires you’d better watch just how far you travel off-road. It’s a Swiss Army knife and for $74,280 it should be. Gas mileage on recommended premium is only 16mpg. You’d be nuts not to love a dream truck like this with every amenity Ford offers, like inflatable rear seat belts, remote start and Wi-Fi. It looks great and treats you like royalty. But that doesn’t mean the Ram 1500 Limited I recently tested isn’t better with its adjustable air suspension, much greater efficiency, and first rate interior…all for 5 grand less.